It’s that time of year again, the sun has gone away, the pools are closed, and the kids are back in school. Rhinovirus and Coronavirus are making their way into our nasal passages and onto our hands and spreading rapidly. I’m talking about the Common Cold. The dreaded sore throats, runny noses, and fevers that plague us for anywhere from 7-10 days all the way to 3 weeks in more severe cases. Sadly there is no cure for the common cold, but there are plenty of over the counter and prescription medications available to ease your suffering. Antibiotics won’t work on a virus, so unless you have a secondary bacterial infection your Doctor should not be prescribing you antibiotics for the common cold. Increased antibiotic use can lead to antibiotic resistance in the community, something all of us in healthcare want to prevent. The signs and symptoms of the Common Cold may be cough, sore throat, runny nose, nasal congestion and sometimes fever. Fever can also be a sign that you have the flu, but that is another blog for another time. If your symptoms are severe or you feel that you have the flu, please contact your physician. If you have a cold or flu it’s best to stay home from work. If you must work, avoid shaking hands with others, wash your hands regularly, and cover your nose and mouth if you have to sneeze or cough. Colds are very contagious during the first 3 days after infection and then taper off from there. The common cold can be caused by over 200 different viral strains and is nearly impossible to gain complete immunity from. What are the risk factors for getting a cold you may ask? Touching eyes, nose, or mouth with contaminated fingers. Spending time in an enclosed space with infected people. There is conflicting evidence to suggest that cold weather or getting a “chill” can lead to you getting a cold. Cold weather does not decrease your immune response. People with stronger immune systems are actually more likely to develop severe symptomatic colds. This may sound like the opposite of what you would think, but symptoms are due to your bodies response to the infection. Those with a weak immune system may actually show less severe symptoms due to a weaker immune response. Prevention of the common cold is relatively straightforward. Avoid people who are infected and places where infected people have been. Regular hand washing is critical in preventing the cold and the flu. When washing hands, any soap will do, it’s actually the action of rubbing the hands together with a soap, rinsing, and drying that removes the virus. Antibiotic soaps are not a requirement. Alcohol based sanitizers do little to prevent the common cold. I remember Paul Harvey on the radio saying around cough and cold season that we should all replace the handshake with a friendly salute. It would do wonders to prevent the cold and flu from being transmitted person to person. If you catch me saluting you instead of shaking your hand please don’t be offended, I am just doing my part. So all this fun stuff aside, you now have the cold, and you feel miserable and you are home from work or school what can you use to treat your symptoms? Do you have congestion? 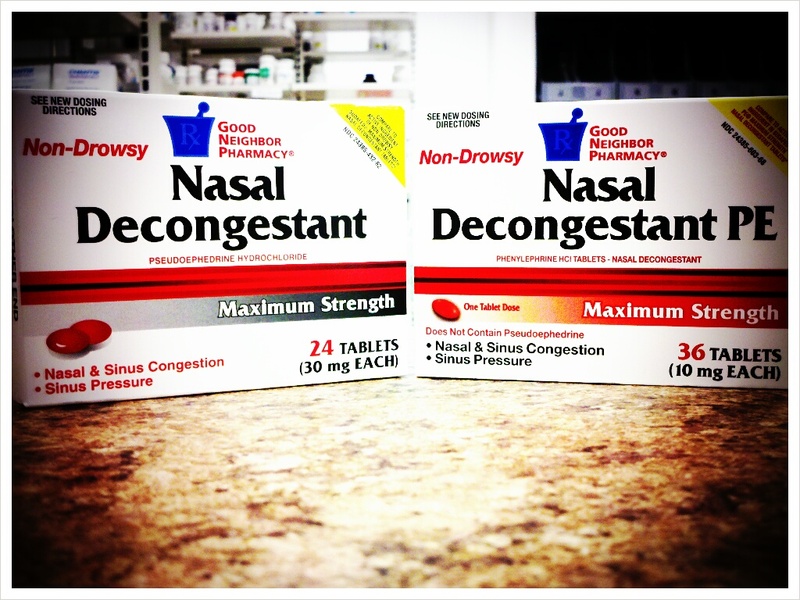 Then you can use Decongestants, these products relieve the pressure in the sinuses helping you to breath a bit easier. You can get decongestants in tablet and spray form but the sprays can only be used for 3 days at a time or you may end up with “rebound congestion.” See your pharmacist or physician if you take medication for high blood pressure, a thyroid condition, and certain antidepressants before taking these medications. When in doubt about a medication interaction, ask your pharmacist! Is your nose running or your eyes watering? Then you most likely need an antihistamine as well. Antihistamines are the “histamine blockers,” histamine causes the reaction in your body that leads to runny nose and watery eyes. They are most commonly used to treat seasonal allergies, but may also work for your cold symptoms. 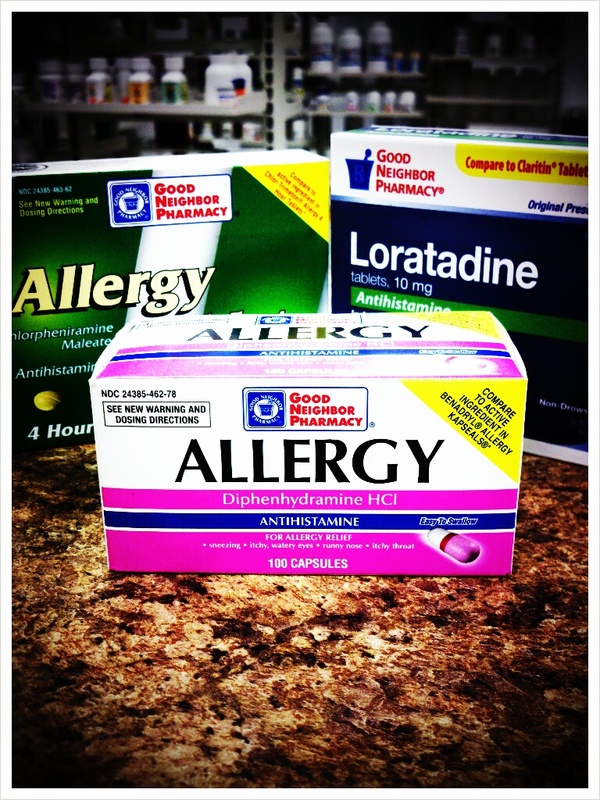 Some antihistamines may cause drowsiness so before you select a product make sure to talk to your pharmacist to determine which one is right for you. You should not take antihistamines if you have certain bladder conditions or prostate problems. (Gonna sound like a broken record here) When in doubt about a medication interaction, ask your pharmacist! If you have a cold you also probably have a cough, your cough may be a dry hacking cough, or a phlegmy moist cough. Both forms of a cough are treated with dextromethorphan(DM), but the phlegmy cough can also be treated by adding an expectorant along with the DM. You can also help a phlegmy cough by increasing your consumption of fluids, or running a humidifier at night when you sleep. 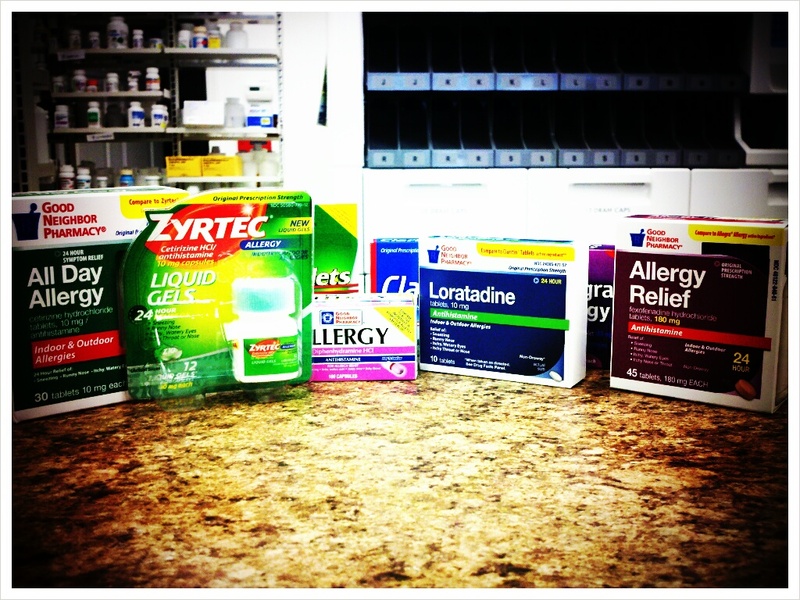 Are you taking prescription medications? Always ask your pharmacist if it is ok before starting a cough suppressant as well, especially if you are taking MAOI inhibitors. 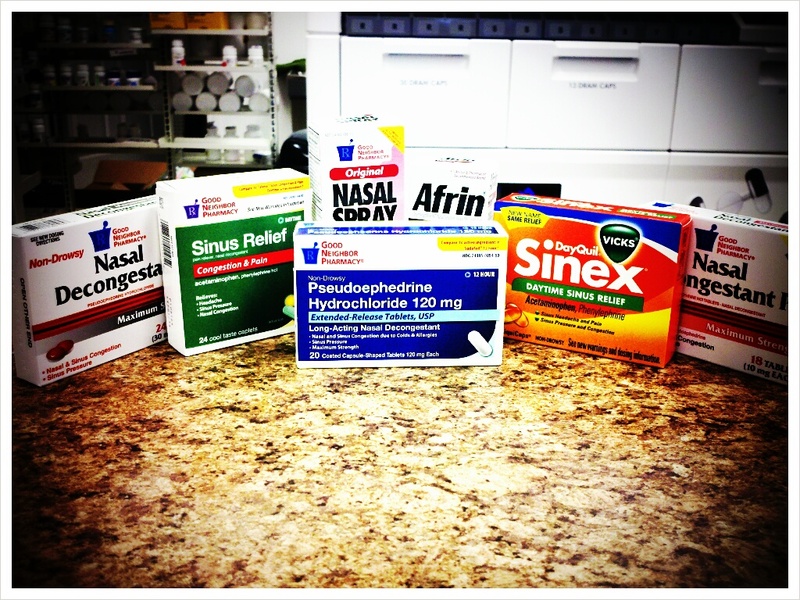 Having body aches, sore throat, or a sinus headache associated with your cold? 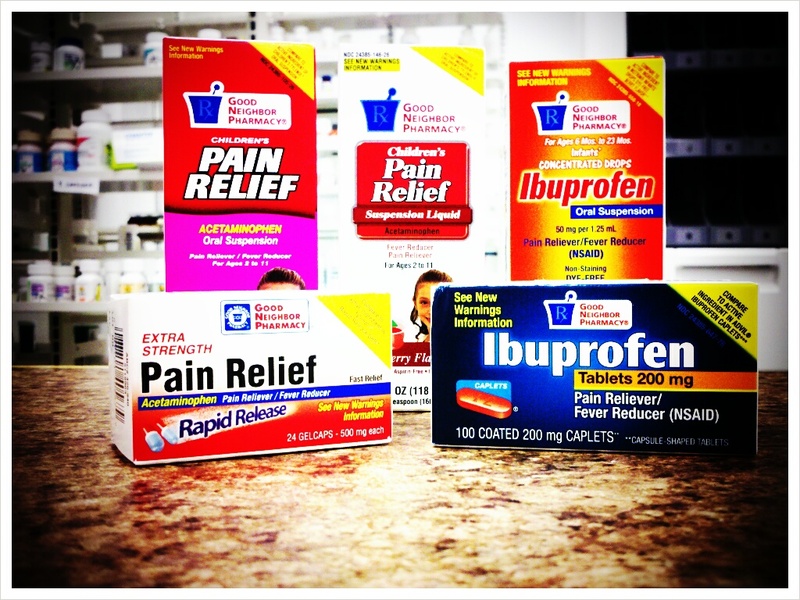 Then you can also use pain relievers like acetaminophen or ibuprofen. These products also help to lower a fever as well. Children under 13 years of age should avoid aspirin and aspirin related products when treating flu like symptoms due to the risk of Reye’s Syndrome. The best choice for children is still acetaminophen in these situations. Anti-inflammatory products like ibuprofen or naproxen may also slightly help in situations of congestion because they can help to decrease inflammation in the nasal passages. 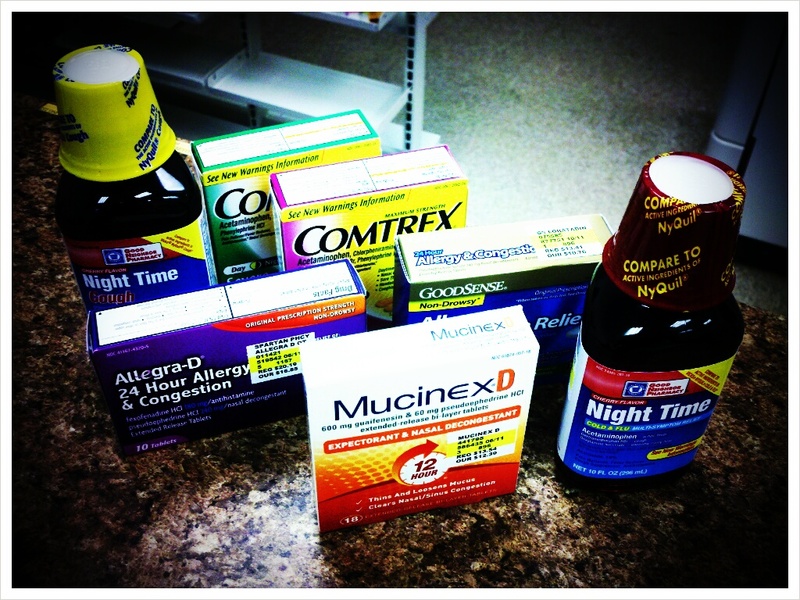 There are also many non-medicated products available over the counter for the treatment of the common cold. Nothing can cure the cold but there is some science behind vitamin C and zinc. Vitamin C has fallen out of favor among most healthcare practitioners for speeding healing of the common cold. Vitamin C is water soluble, and therefore very hard to overdose on. We don’t recommend you try that though, keep your doses below 2000mg a day to prevent stomach upset, diarrhea, and cramps. Vitamin C can interact with some medications as well, so check with your pharmacist if you take anticoagulants, aspirin, barbiturates, sulfa drugs, salicylates or tetracyclines. You should also watch your consumption of vitamin C if you suffer from gout, kidney stones, sickle cell anemia, or iron storage disease. Zinc is believed to help speed the healing of the common cold, but there are studies that also show that it is no more effective than a placebo (sugar pill). Zinc is best taken in a lozenge form as the tablets can lead to stomach upset and nausea, zinc nasal sprays have mainly been removed from the market due to the risk of permanent loss of smell. For zinc to work correctly you need to take 9-24mg of elemental zinc every 2 to 3 hours. Zinc products should not be used for longer than 5 days, the most common side effects are temporary loss of taste, metallic taste in the mouth, stomach upset, and mouth irritation. Long term use of zinc can lead to a copper deficiency, so please keep your usage to 5 days. Zinc is not recommended for use in children. Zinc can be toxic if taken incorrectly or in too high of a dose, remember to ask your pharmacist if you have any questions! 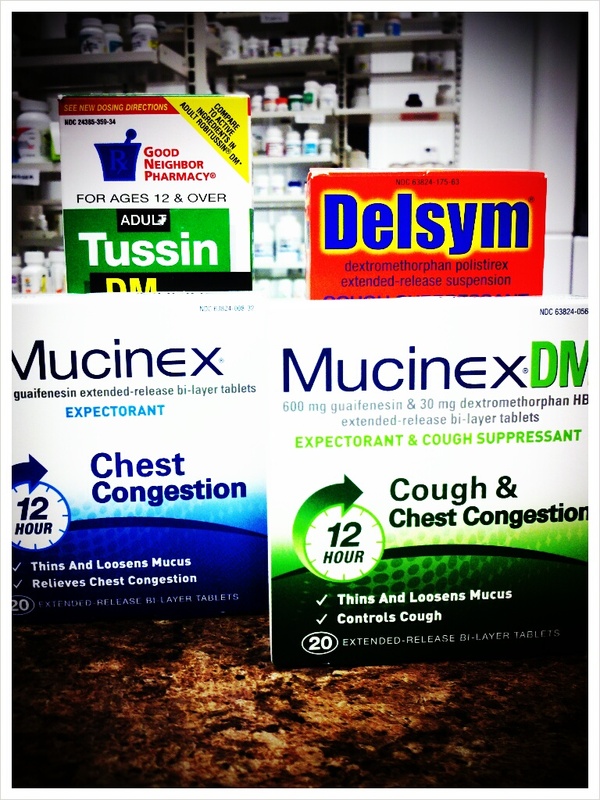 There are also many combination cold and flu products over the counter that combine many of the more popular medications into one convenient dose. Since many of these products contain multiple ingredients it is always best to ask your pharmacist which product best suits your collection of symptoms. Don’t have ready access to your pharmacist? Make a list of your symptoms and find the product that covers them. If you don’t have congestion, don’t take a product that has a decongestant, since there is no reason for you to medicate yourself for that symptom. Many people just prefer to use single symptom products and combine them as necessary to treat their particular mix of symptoms. 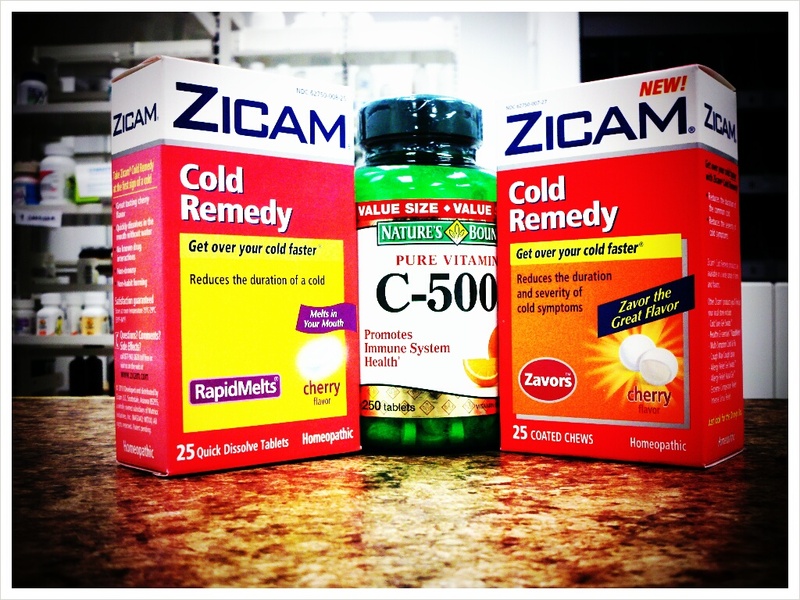 Some Examples of Combination Cold Products. Everyone who has a cold should get plenty of rest, drink plenty of fluids (water, gatorade, juice, etc-dehydration can put you in the hospital), and eat regular meals. Hang in there, colds can last on average up to 10 days! If the symptoms last longer than 7 to 10 days or become severe you should make an appointment to see your doctor. Colds lead to 75-100 million physician visits annually at a cost of over $7.7 billion a year!! Americans alone spend over $2.9 billion on over the counter drugs, and another $400 million on prescription medicines for symptomatic relief. More than 1/3 of patients who saw a doctor received an antibiotic prescription, this has implications for antibiotic resistance from overuse of these drugs. 22-189 million school days are missed annually due to a cold, this can lead to 126 million lost workdays for parents who stay home to take care of their children. 150 million workdays are missed by employees suffering from a cold! The total economic impact is believed to be over $20 billion per year! This number accounts for 40% of time lost from work. My best advice is to practice good hygiene, wash your hands, avoid contact with seriously sick individuals and get plenty of sleep! Nothing is truly going to prevent you from getting a cold but I hope you don’t get one! Today I figured I would talk to you about a supplement that has been in the news and medical journals a great deal in the last few years, Vitamin D.
Vitamin D is one of the fat soluble vitamins (A, D, E, & K). A fat soluble vitamin just means that there must be a small amount of fat in the gut along with the vitamin for your body to properly absorb it. Fat soluble vitamins are also able to be stored in the body’s own fat stores as well and released at a time when the body needs them. Vitamin D promotes the absorption of Calcium in the gut and also helps to maintain sufficient calcium levels in the blood. Calcium is essential for the normal mineralization of bone, it also is needed for proper bone growth and bone remodeling. A vitamin D deficiency can lead to brittle, thin, and misshapen bones. Vitamin D is vital for the prevention of rickets in children and osteomalacia in adults. Along with regular calcium supplementation vitamin D also helps to prevent osteoporosis in adults. Vitamin D also plays a role in cell growth, your nervous system, your immune system, and works as an anti-inflammatory. 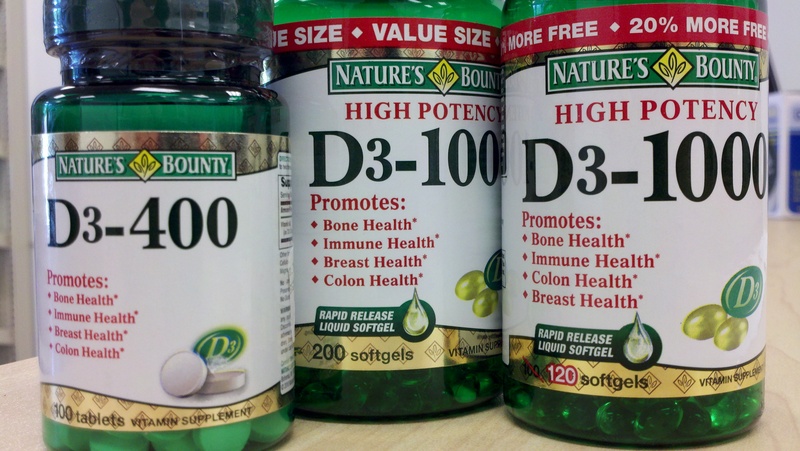 Vitamin D is not found in many naturally occurring foods in very large quantities. The most common sources for vitamin D in our diets are fatty fish like salmon, tuna, and mackerel. There is an abundance of D in fish liver oils (IE: cod liver oil). Small amounts of D are found in cheese and egg yolks as well as some mushrooms. Fortified foods are the most common places for us to find Vitamin D in our diets. Almost all milk sold in the U.S. Is voluntarily fortified with Vitamin D up to 100 IU/cup (IU= international units). You may also find vitamin D fortification in breakfast cereals, some orange juices, yogurt and some margarines. Infant formula is mandated to contain 40-100IU of vitamin D in the United States. Our other source of Vitamin D intake comes from our own bodies. When exposed to sunlight our bodies use UV light to convert “previtamin D” to vitamin D3. How much vitamin D your body produces varies based on the season, time of day, length of day, cloud cover, pollution clouding, skin melanin content and sunscreen coverage. When the body is exposed to sunlight it converts the vitamin D and stores it in the liver and the fat stores within the body. Sunscreens are essential for protecting our bodies from too much UV light which can lead to a painful burn, premature skin aging, and increased risk of skin cancer. But that same sunscreen also prevents your body from producing its own vitamin D! Most researchers agree that 5-30 minutes of sun exposure (without sunblock) between 10am and 3pm at least twice a week gives you adequate vitamin D for day to day bodily operation. 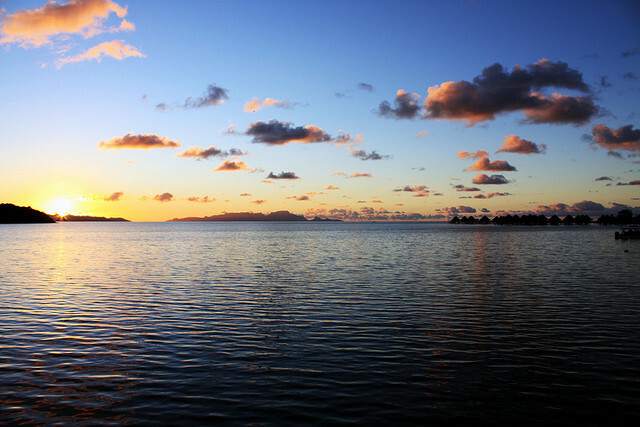 For people who cannot be in the sun or who do not get enough sun exposure supplementation is necessary. You may also hear from different sources that there are two types of vitamin D, D2 (ergocalciferol) and D3 (cholecalciferol). You will hear many things that may tout one source as better than the other. That is not entirely true. Traditionally both sources have been seen as equivalent in their ability to prevent rickets, and most of the steps involved in metabolizing D2 and D3 are identical. Vitamin D is also essential for infants and children. Human breast milk does not contain enough vitamin d to meet the required intake. The American Academy of Pediatrics (AAP) recommends that exclusively and partially breastfed infants receive supplements of 400IU/day. They should receive these supplements from birth until they are weaned and consume greater than 1000IU/day in Vitamin d fortified formula or whole milk. Older children and adolescents should also be receiving 400IU per day either through fortified milk or supplementation as well. If you have any questions about whether your child should be on a Vitamin D supplement please make sure to talk to your pediatrician!! This is not an inclusive list of all doses for children either. Many studies have also been done on Vitamin D as a cancer fighter. While most of the research is promising there is not enough solid evidence to prove that vitamin D will prevent cancer. The most promising research into the health benefits of vitamin D have come with colon cancer and breast cancer. There are mixed results with other forms of cancer though. Pancreatic cancer risk has been shown to increase with high blood levels of vitamin D. Nothing is definitive with these studies but I feel this re-enforces the need to keep your intake of vitamin D within the recommended daily allowances. The only reason to take larger doses of vitamin D would be due to deficiency and under the care of a licensed physician. Remember, too much of a good thing can be a bad thing!! Too much vitamin D could lead to vitamin D toxicity, which could manifest itself as weight loss, anorexia, heart arrhythmias, and even great risk for increase blood calcium levels. Increased blood calcium levels can lead to damage of the blood vessels, heart, and kidneys. Luckily for the sun lovers of the world, there has never been a documented case of too much vitamin D due to sun exposure. (But don’t go running outside for hours unprotected to prove this). Food is very unlikely to cause an increased risk for toxicity either. Most cases have been seen only from over supplementation by individuals who were not under the care of a physician and undergoing blood tests for serum D concentrations. Vitamin D also has the potential to interact with certain prescription medications. Corticosteroids such as prednisone (used to reduce inflammation) can decrease calcium absorption and decrease your bodies ability to break down vitamin D. Long term use of steroids can increase the risk of osteoporosis. Weight loss drugs like Xenical or its over the counter cousin Alli as well as the cholesterol lowering drug cholestyramine can decrease the absorption of vitamin D and other fat soluble vitamins from your GI tract. Phenobarbital and Phenytoin (Dilantin) which are drugs most commonly used to treat epileptic seizures can also increase your bodies breakdown of vitamin D and decrease your bodies ability to absorb calcium. 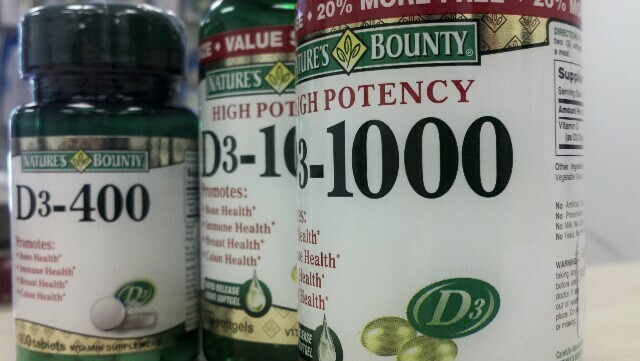 When it comes to over the counter supplementation you can over do it. But by consulting with your pharmacist or doctor you can add supplements to your diet safely. 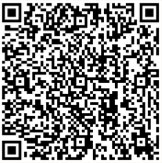 Please stop by and see us in the store if you have questions about dietary supplements. Never assume that because an item is available over the counter that it is 100% safe. Many of the items sold over the counter are powerful medicines that can cause you a great deal of harm if you take them incorrectly or over do it. Be Cautious in the Heat of the Summer. Summertime is probably a favorite of most people in Pittsburgh. Aside from the humidity, the warm sunny weather brings everyone young and old outside to play or work and enjoy being out of the house. With the increased heat of July, August, and September the risks of being outside do increase though. Heat Exhaustion and Heat Stroke are two similar but different risks to being outside in the summer sun. Would you know how to tell the difference if a loved one was suffering from one of these conditions? There are ways to immediately cut your risks of getting either of these uncomfortable or life threatening conditions. Time your outdoor exercise or yard work to fall outside of the hottest times of the day which are between 11am and 4pm. If temperatures were to be greater than 104 Degrees you should avoid strenuous outdoor work for that day! Working on days when the humidity is high also increases your risk because the humidity prevents your body from being able to adequately cool itself. Heat Exhaustion is a condition caused by dehydration and can lead to Heat Stroke which is a medical emergency. To prevent Heat Exhaustion make sure that you take breaks from strenuous work, allow your body to cool down in the shade or in an air conditioned room, and drink plenty of fluids (Water and Sports Drinks). A good rule of thumb is drink a cup of water for every 15 minutes of strenuous outdoor activity or exercise. Thirst, nausea, vomiting, pale moist skin (cool to the touch), rapid breathing rates, weakness, headache, muscle cramps and a feeling of light headedness. If you feel you or a loved one has a case of heat exhaustion encourage them to get to a shaded area or better yet an area with air conditioning. It may also help to have them lie down or recline and elevate their feet. Cool compresses on the neck and armpits also helps to speed the recovery process. You could also have them cool off in a cool shower and drink water slowly. Gorging with water will not help, they need to drink a half cup of water every 15 minutes and replenish the water at a consistent pace. If this doesn’t take care of the symptoms please have them seek medical attention immediately. Heat Stroke is a much more dangerous situation that usually results from a case of heat exhaustion that has gone too far and is untreated. Heat Stroke is when the body is no longer able to cool by sweating and begins to shut down. The body overheats and can do substantial damage to internal organs. Heat Stroke can be fatal if the patient is not treated quickly by medical professionals. Fever as high as 105!, irritability, dry red hot skin, fainting, rapid but very shallow breathing, confusion, rapid pulse but very weak to detect, seizures, and coma. If you feel that a loved one may have heat stroke seek medical attention IMMEDIATELY. Call 911. Be ready to give CPR if necessary. If you can get the person indoors where it is cooler, do so right away. Elevate their feet a bit, try using cool compresses on the neck and especially in the armpits. Have them drink water slowly as well. Follow the guideline of 1/2 cup of water every 15 minutes until help arrives. Other things you can do to help prevent both of these conditions is to limit your alcohol intake and caffeine intake while you are outside in the heat. If you are at a picnic or ball game make sure that you are substituting water in between alcoholic beverages to make sure that you don’t get dehydrated. We all want you to be able to enjoy your summer because no one wants to be stuck in the hospital with a condition they could have prevented with a little planning and sense. We hope you all have a great, happy, and healthy summer! 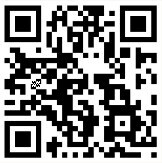 Don’t forget to stop in and see us for sunblock for your summer vacations and pool parties! !